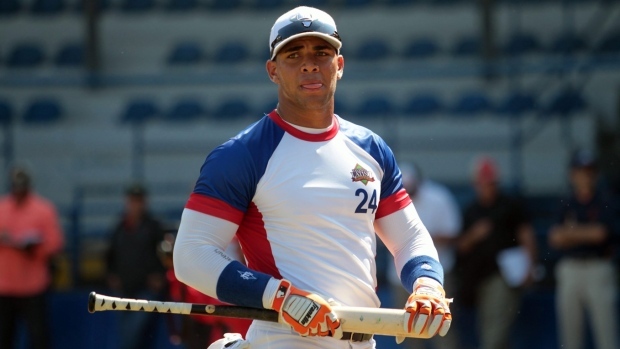 FORT MYERS, Fla. - Having finalized a contract for a record $31.5 million signing bonus, 19-year-old Yoan Moncada likely will start his minor league career this season at Greenville of the Class A South Atlantic League. "My goal is to find out if I can make it to the big leagues in a year," the infielder said through a translator during a news conference Friday, a day after his agreement was finalized. "I know not having played for so long it's understandable that it might take a little more time than that." Moncada was in uniform Thursday at Boston's minor league camp in Fort Myers, even before the agreement was announced. He said he feels most comfortable at second base, the position he played last year in Cuba with Cienfuegos. He hit .273 with a team-high 13 extra-base hits in 45 games. "Now I'm here and want to get to work," said Moncada, listed by the Red Sox at 6 feet, 215 pounds. He could remain at extended spring training before reporting to a minor league team. "Whatever time he needs in Fort Myers, we want to give him that," Red Sox general manager Ben Cherington said. "We expect Greenville at some point." Cherington called Moncada an "atypical talent." "First of all we believe he's one of the one of the most talented 19-year olds in the world," Cherington said. "He's got a really unique combination of skills. Great athlete. Speed. Switch hitter with power from both sides of the plate. Defensively, the athletic ability to play multiple positions if he had to. A natural second baseman. So as I said he'll enter our minor league system like everyone else. "There's still development to do. He's still a developing baseball player but he's an exceptionally talented one. ... We believe he can be a very good major league baseball player for a long time. And we're committed to helping him get there in the right way." Red Sox Manager John Farrell said Moncada is not likely to play in any big league exhibition games this season. Boston started keeping track of Moncada in international competition in 2010, according to Eddie Romero, the team's director of international scouting. Romero said he first watched Moncada in the Netherlands in the summer of 2013 in the World Port Championship and later that year scouted him in Taiwan. "And there was no doubt the tools stood out," Romero said. "An aggressiveness and excitement to his game." "It was a very tough process," Moncada said. "But I'm thrilled to be able to join the Red Sox." Moncada didn't detail how he left Cuba or what relatives he has in the United States. He wouldn't say whether President Barack Obama's decision to normalize relations with Cuba might make it easier for him to travel back to see his family. "I don't know much about the ongoing relations," Moncada said. "I hear some good things about it and the possibilities, but really I'm just focusing on getting here and just wanting to play ball. That's my No. 1 focus as of right now." When he was asked after the news conference about his father and learning to play baseball as a young boy, Romero said Moncada wouldn't discuss those topics. Moncada receives $5 million of the signing bonus within 30 days of the contract's approval by Major League Baseball and $2.5 million by Dec. 31, according to contract information obtained by The Associated Press. In 2016, he gets $2.5 million by Jan. 31, $3 million by April 1 and $2.5 million by Oct. 31, and then in both 2017 and 2018 he receives $5 million by Jan. 31 and $3 million by Oct. 31. Moncada will cost the Red Sox $63 million, including a tax penalizing them for the signing. They have spent $37,505,000 on international amateur free agents during this signing period and pay a 100 per cent tax on the amount over their pool total of $1,881,700. The tax, $35,623,300 unless it is increased by more signings, is due to MLB by July 30. According to baseball's collective bargaining agreement the commissioner's office "may use the tax proceeds to further the international development of baseball." In addition, for the signing periods starting on July 2 this summer and in 2016, the Red Sox will be ineligible to give a signing bonus of more than $300,000 to any international players subject to the pool. The previous high signing bonus for an international amateur free agent under 23 was $8.26 million for pitcher Yoan Lopez, who finalized an agreement with Arizona on Jan. 16. Moncada is the second high-profile Cuban to sign with the Red Sox in the past year following outfielder Rusney Castillo, who made his big league debut in September after signing a $72.5 million, seven-year contract. Former Red Sox pitcher Luis Tiant, who also left Cuba to play in the major leagues, sat several feet to Moncada's left at the news conference Tiant, now 74, said he didn't get a signing bonus when he joined the Cleveland Indians' organization in 1961 and started in the minor leagues with a salary of $150 per month. "I didn't have any complaints," Tiant said.